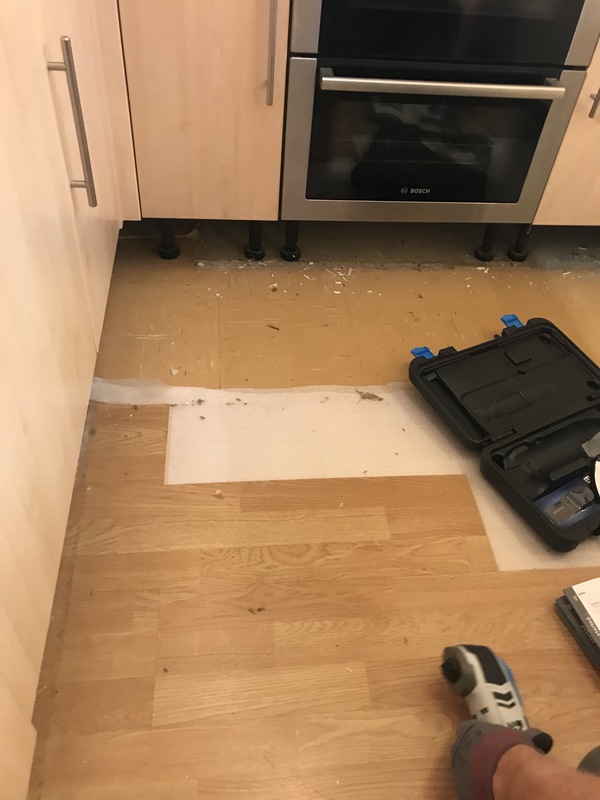 1 year on – New Kitchen Floor!! Poor blog I have neglected you for far too long! I can’t believe I have had this lovely little flat for a whole year now! In honour of this anniversary I finally have a new kitchen floor! 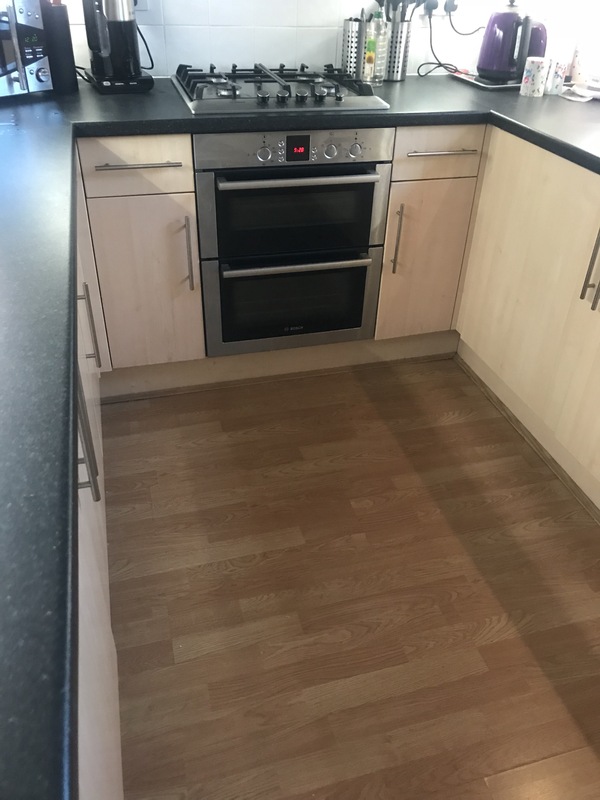 Not a bad floor, but ever since I moved in I really wanted to brighten up the kitchen as the wood effect floor made it all look a little bit too dark. So my dad is rather gifted in the art of DIY and dedicated a weekend to transforming the kitchen floor. Multiple floors under the existing floor! Every room in this flat seemed to have three others underneath it. The flat is being glossed today so I was not allowed in through fear of sticking to a newly glossed door or smudging a painted skirting board. The decorators banned me which is pretty much fair game as I am incredibly prone to falling over my own feet and genuinely cannot be trusted. That’s ok though because I had a very successful trip to IKEA and the Range in Reading instead. I demonstrated the exact reason why I was banned when we went to IKEA and mother trod on the back of my shoe and I stacked it going up the escalator. It is a good thing I am used to these moments. 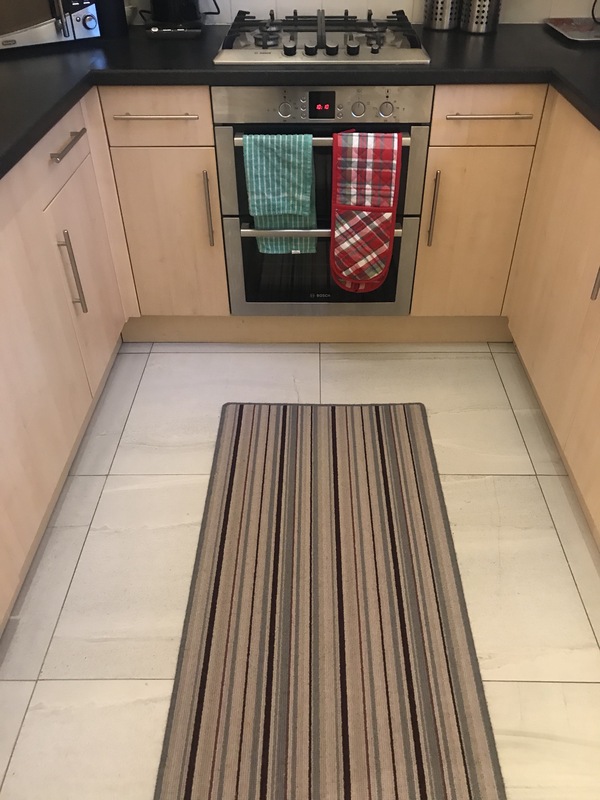 I did pop back to the flat afterwards though as I bought a doormat. So under the pretence of “dropping off the new doormat” I snuck to the flat. Anyone who knows me personally will know that I am a bit of a hedgehog. Prickly on the outside (in personality, not physical appearance thank you very much), prone to frequent hibernation and runs away to curl up into a small spiky ball when scared. However once you get past that grumpy spiky appearance (or I have had a cup of coffee / it is past 8am in the morning) I am the craziest but friendliest person you will ever meet. Rather mixed day today. The painting is done and looks fabulous. Turns out I underestimated the amount of paint needed by about 10 litres resulting in a dash to B&Q early this morning. I’m really happy with my plum feature wall and now I can see the living room nearly done I’m definitely happy with yesterday’s choice of carpet. However there is a small issue of a hole in the ceiling. There was what looked like an old water stain on the ceiling in the bedroom upstairs and when we rolled the new paint on it has dampened and weakened a rather awful attempt of a repair. Luckily we have tested it for damp and there was no moisture reading so the ceiling is completely dry and obviously just old which is good, just a shame that I now have a hole in my newly painted ceiling! Seems like we will be sending dad up into the rafters later on this week strengthen and replace the shoddy work previously done. I’m contemplating sending him up with a load of loft insulation while he’s up there and he can distribute it out like a little rodent. Anything to reduce the electric bill right? However in better news the plum wall is done and I love it! Tomorrow is glossing day so I am sadly banned from the flat until at least 5pm in order to let it all dry. I don’t appear to be trusted not to stick to a door or smudge a skirting board. Even the painters know my clumsiness well it seems! We have paint on walls! Not finished yet but it is definitely a start. Base coats are more or less on and some rooms are looking nearly finished! However I’m assured we are no where near finished but to me it’s looking pretty good already. The kids wallpaper is definitely gone in the second bedroom and where the feature wall was in the living room has been filled and is now looking a lot better. Currently having the big debate which colour carpet to have. I know I want a fairly neutral tone so that I can choose to redecorate in the future without having to turf my carpet up! I know I am an indecisive human being but this is taking the biscuit. The White Mist I chose for the walls has a grey tone to it rather than a peachy or beige tone so I am leaning more to the grey end of the spectrum to compliment it. 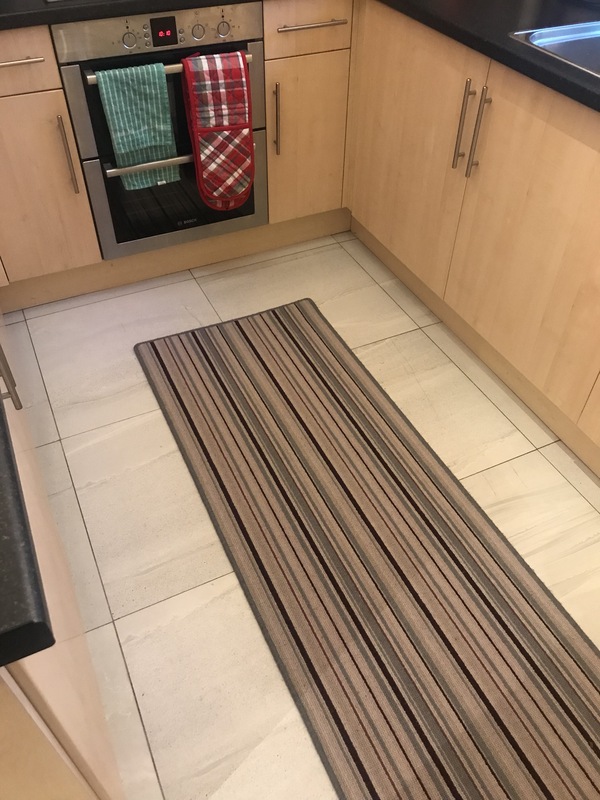 I have never had to choose a carpet before so I have no idea what angle to tackle this from but I am rather tempted by stripey carpet up the stairs! Due to a lack of internet Day 2 is actually being posted on day three. Day number 2 and my lovely little flat is even more destroyed! However I am sure the end result will be 100% worth it! Thanks to the lovely Chris and Victor the ceilings are now nearly all painted. My lovely brother visited today and chipped in by removing the carpet from the stairs so now all the carpet is gone. I spent the day helping remove laminate flooring which we had finished turfing up and scraping an underlay off the floor so I guess you could say I was helping! We decided to put my car into the garage (I have a garage!) to make some more space to park the van. Turns out I have a garage which is too small to fit my car in! My car is a tiny little Vauxhall Adam so I didn’t think I’d have a problem, I just assumed the garage would be big enough. When I went to view the flat I never thought of asking to test the garage to see if the car would fit! Lesson’s learnt I guess. However on the flip side we have discovered that there is a pizza place a 3 minute walk away which makes amazing pizza! You win some and you loose some! I have had the keys for 24 hours now and the first full day of work is done! We have had a very productive day of filling, destroying a laminate floor and removing a carpet! Click here to see what it looked like only 24 hours ago! Little bit of destruction happening here huh? All will be worth it in the long run! We were a little bit confused as to why the laminate floor in the lounge felt a bit squishy and it turns out there was a whole layer of carpet under there! I quite enjoyed turfing up the laminate floor and scraping the underlay off of the floor, I may be banned from actually constructing or painting anything but I can destroy well! Shall see what day 2 brings tomorrow! However as it is a Sunday I think it will be quite a quiet one, don’t want to irritate the neighbors too much after the noise and chaos we have created today! Being English we are a stereotypical family of tea drinkers. Love the stuff. Yorkshire Tea especially along with Twinings Fruit Infusions, Chamomile and Earl Grey. We are currently at the new flat. There’s lots of work being done by my dad and the decorator who is called Chris. Dad warned Chris not to let me near a paint pot or any filler so I have been relegated to the very important role of “Tea Maker”. I do make a good cup of tea! Before my first visit to the flat yesterday I bought tea, coffee, hot chocolate and milk. I offered my dad a cup of tea before realising I hadn’t moved any mugs in yet! So there was no tea for dad that night. However this morning I was prepared for my job as Tea Maker. To avoid going through all of my stuff to find some mugs I borrowed some from the parents and took them to the flat. I offered Dad and Chris a cup of coffee and went to the kitchen to make it. I got the mugs out and went to boil the kettle. It then dawned on me that there was no kettle. Having failed at my job for the second time in two days I snuck over to the petrol station across the road and got two lattes. A small thing like a lack of kettle will not stop me from fulfilling my job as Tea Maker. However as I was not actually making tea I should probably rename my job to “Beverage Maker”. Actually I did not make the coffee either due to lack of kettle so I think in fact it should be “Beverage Provider”. “Simple value cordless white kettle” which cost me the pricey sum of £5.49. I was a little bit concerned that there was no plug on the kettle so resorted to unpacking it in the middle of the town centre just to check. Turns out that when they say “cordless” they mean the actual kettle, not the electric bit it sits on and there is infact a plug! Who knew?! It looks and feels exactly like what you would find in a budget hotel room and is absolutely perfect for an emergency little kettle. Tea making can commence!! As long as you don’t mind waiting 10 mins for the little kettle to boil I’ll make you a lovely cuppa in exchange for you dragging all the laminate flooring we’ve turfed up down the stairs! 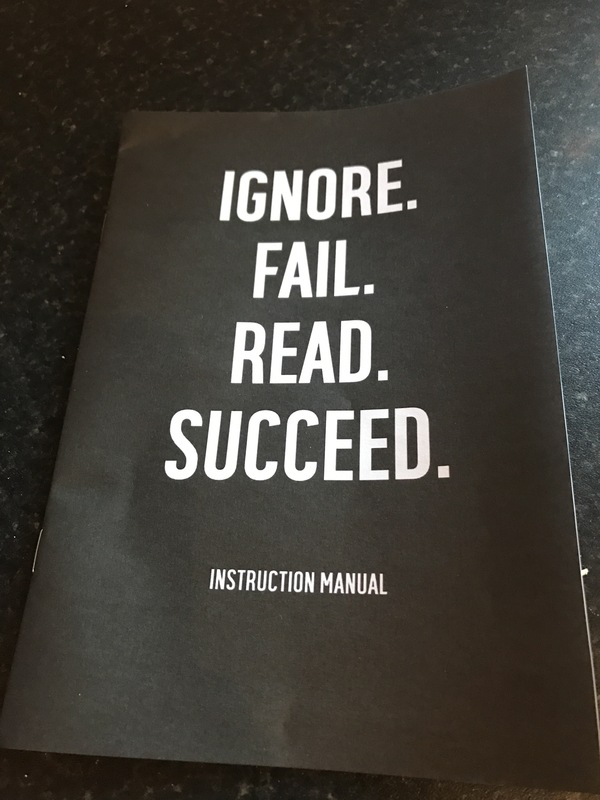 Nearly forgot, look at the instruction manual! Made that very clear didn’t they! Good old Argos….